Former Wales defence coach Rowland Phillips says he can understand scepticism surrounding the two new Italian teams in the Magners League. 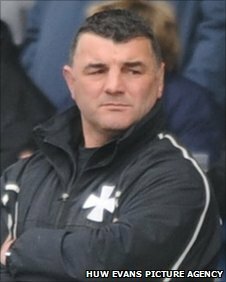 The ex-Wales dual-code international is defence coach at new Viadana-based club Aironi who start the campaign away at former champions Munster. "I can understand people aren't sure what to expect," Phillips told the BBC. "The expectation on the outside is scepticism but on the inside it's new for us." Aironi - Italian for Herons - have been formed to play in the Celtic competition and while based at Viadana, are a collaboration between clubs that also include Gran Parma, Rugby Parma, Colorno, Noceto, Reggio Emilia, Modena and Mantova. They will largely be based at the 5,000 capacity Stadio Luigi Zaffanella in Viadana and play bigger games in nearby Reggio Emilia at the near-30,000 capacity Stadio Giglio. Treviso are the other Italian side to join the newly expanded 12-team league which starts on the weekend of 4 September. But their arrival has drawn concerns including Welsh Rugby Union chairman David Pickering. He told the Western Mail : "There are concerns. Are Italy significantly well placed to take this opportunity? "That is the major worry I hear from our regions in Wales and that is the challenge facing Italian rugby. "The rest of the Celtic countries have reached out with an olive branch and it's now up to Italy to make the most of what has happened." Phillips, who is a former Ospreys assistant coach, admits the two Italian sides do not know what to expect from the forthcoming season. "There's a lot of excitement but I think also we've got to be prepared for the fact that this is a huge competition and one of the toughest competitions in world rugby at club level," he said. "We need to be realistic and keep our confidence high because it's going to be a tough, long season. "Our first game is Munster away and if we ever wanted to know where we are, after that weekend will answer that question a bit clearer. "It's putting together a team, it's developing certain parts of the game and maybe showing progress and performance and hopefully after that we can get some results and success. "I'm sure it's going to be the right decision and as a group we are going to move forward."